Dublin-based Paddy Hanna is a solo artist affiliated with the Popical Island Collective and a member of Grand Pocket Orchestra and Skelocrats (recent review here). 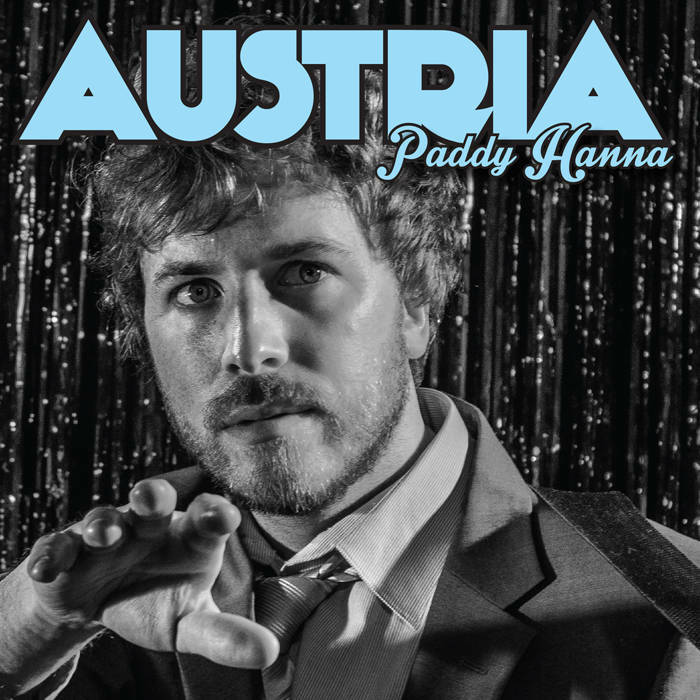 As a solo artist, his next release is a two-song single titled "Austria", which will be available on May 11 via Trout Records in digital and limited edition vinyl versions. The title track is upbeat and melodic, with crooning vocals reminiscent of some of Richard Hawley's recent work. The B-side, "Camaraderie" is a more melancholy tune, with introspective lyrics over beautiful guitar lines. The single is an excellent introduction to a gifted songwriter and performer. Test drive the two songs below. In addition to Hanna, the players for the Austria single were Mark Chester, Bobby Aherne, and Enda Canavan. We introduced Philadelphia trio The Stammer in 2012 when they released their debut EP. Brian, Zach and Gavin are preparing an album, and wanted to let everyone know what to expect. Thus, we have the free song "Hey Joan". While the theme is giving a friend hard advice, the music is hazy, shimmering guitar pop with a propulsive rhythm and delicious sounding guitars. If you are like me, you'll be disappointed that there is only the one song, but if you are resourceful, you'll note that Bandcamp has some previous releases available for the same great price. That should help you out until the album is available. And trust me, "Hey Joan" holds up very well to repeated plays. I haven't stopped yet. Mac McCaughan has been providing listeners with thrilling music for almost three decades in under several band banners -- most notably Superchunk and Portastatic -- but today's release of Non Believers marks his first album under his own name. I don't know what factors prompted him to make this album the first, but he couldn't have chosen better. To me, Mac has always had a punk rock heart. But for Non Believers he works with cleaner guitar tones and synths. He can still raise a righteous ruckus, as evidenced by the excellent "Box Batteries " (stream below), but overall the instrumental fury is dialed back, with a template that is more post punk and new wave, with echoing machine drums and subtly layered sounds. The choice works well, as it gives more space to themes such as nostalgia, alienation, and melancholy. His weathered voice also benefits, as his punk shouts shift well to experienced croons. A gifted songwriter throughout his career, Mac's ten songs here may be his best and most consistent collection, bursting with warmth, sentiment and understanding. This album should be of great interest to fans of Mac and his other projects, but in my view its worth isn't tied to the past. I think it is an excellent album that would be welcome in the music rotation of any fan of indie rock. In Mac, I am a believer. Maurice Sendak's Where the Wild Things Are is widely known and loved, so any body of music that takes its name from that book will be judged with a critical eye. 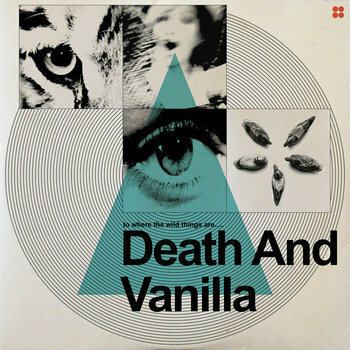 Swedish band Death And Vanilla has created such a work with new album To Where the Wild Things Are, and it proves itself worthy of the comparison. A thoughtfully crafted and delightfully expressive combination of vintage psychedelia, dreamy electronica, and baroque pop, it has hooks and depth, and is completely satisfying. While there is heavy reliance on electronics, the music has a warm, shimmering feel derived from the delicacy of the arrangements and use of analogue equipment. Nilsson's voice floats in like a apparition in the mist, whispering in the background. The hazy vibe is amplified by the duo's choice to record using one '70s microphone purchased at a flea market. Perhaps we could call it haunted pop from your favorite ghost, but the result is the perfect soundtrack for the literary work it honors. We've provided a few tracks for you to evaluate - "California Owls", which for me recalls the Velvet Underground, the dreamy "Arcana", and "Time Travel", which reminds me of the Beach Boys. This is absolutely lovely music, and one of the best ten albums I've heard so far this year. Death and Vanilla are Maleen Nilsson and Anders Hansson, and they are from Malmo, Sweden. To Where The Wild Things Are is out now on Fire Records. Skelocrats are a Dublin four-piece who are part of the Popical Island Collective. They previously released two EPs (and then re-released them as a combined "greatest hits album). The members all sing, and presumably all contribute songs reflecting their own interests and other music projects. 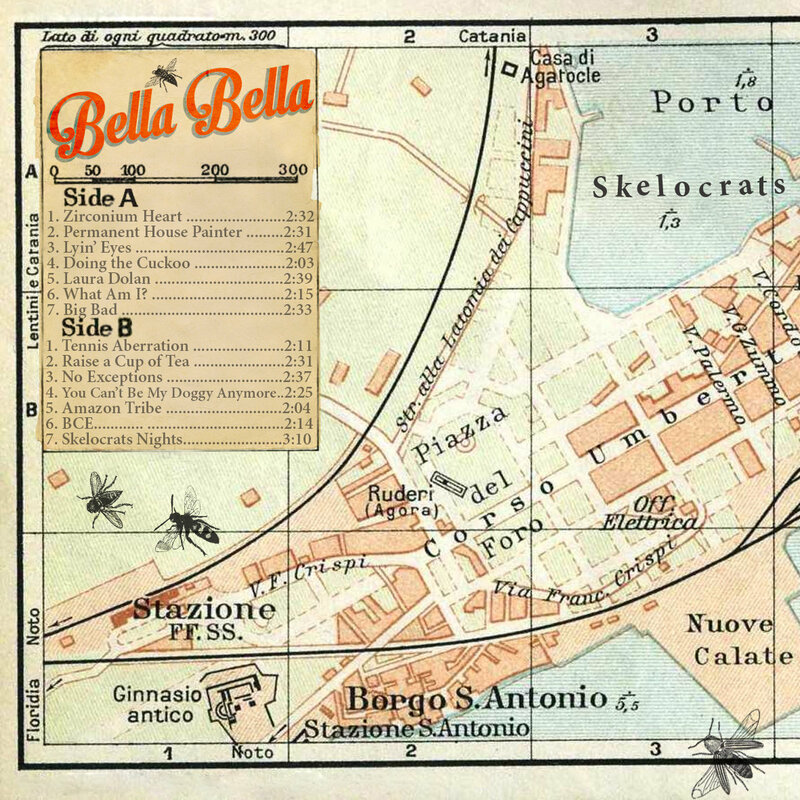 The result on their new album, Bella Bella, is generous 14-song set of varied pop songs. How varied? Well, when suggested influences include Sonny & The Sunsets, Guided By Voices, Ariel Pink, The Magnetic Fields, The Buzzcocks and The Nerves, you know you aren't going to get the same song recycled. While covering a bit of the old map in terms of style, the songs share a direct approach, a charmingly shaggy garage pop delivery, and a focus on melody and sunny vibes. Kicking off with the chugging, woozy, and breathlessly energetic 80s-tinged "Zirconium Heart", and then launching into one of my favorites, "Permanent House Painter", boasting a sing along chorus, you realize that this band isn't going to sit back and plead for your love, they are going to sit on your lap, give you a kiss, and then pull you up to dance. Then they pour sweetness over your head with "Lyin' Eyes". Your respite is brief, however, because the next track is the hoedown flavored "Doing the Cuckoo". The following "Laura Dolan" is a sincerely crooned pop gem. And so it goes, with infectious pop song following infectious pop song. Whether it offers dusty Americana ("Big Bad"), Buzzcocks style pop punk ("Tennis Aberration"), pub sing-along rock ("You Can't Be My Doggy Anymore"), or sparkling 80s indie pop ("Amazon Tribe"), this is perfect music to make you feel good on a spring day. Yeah, Skelocrats aren't a big name, and there is no big PR machine hyping this album, but this is an album you actually will use over and over like that favorite leather jacket. I suggest that this album is well worth your time and money. I've included a few personal favorites below, but you can stream the entire album at the Bandcamp and Soundcloud links. Skelocrats are P. Cooney, B. Murphy-White, and Paddy Hanna. Bella Bella is out now via Popical Island. Dreamy guitar pop with country accents and a vibe suggestive of sunny skies, warm breezes, blue skies and open spaces. Yes sir, The Outdoor Type is aptly named. The EP opens with the wide-scope "When The Sun Goes Down". Driven by an anthemic chorus and ringing guitars and synths, it signals that the listener is going to enjoy a sweet ride. The following "Are You Happy" is a more relaxed, but still upbeat, country-flavored song that would be the perfect soundtrack for a drive on a sunny afternoon. "I Tell You What I See" gives the template a tasty twist, combining the country feel of the preceding track with the '80s-style chorus of the opener, all in a more brooding package. At this point, I was thinking that no matter what else Zack drops on us for the following two songs, he still has created a successful EP. But the young man needs no sympathy, as the fourth track, the fast-paced jangle pop gem titled "Onions and Avocados", may be the sleeper hit on this EP. The record closes with the beautiful dream pop lullaby, "Day To Day". With five delightful songs, The Outdoor Type EP signals the arrival of an exciting pop artist. Snap this one up and your life will be better. And hope more is forthcoming. The Outdoor Type EP is out now via Habit Music Company. You also can find it on iTunes.